The Kano Durbar is a fantastic festival and procession held regularly in Kano, Nigeria. Featured in the processions are thousands of horsemen in antique ceremonial gear - the horses wearing ornate bridles and saddles; the men in billowing colorful robes and turbans. According to this article, the durbar was encouraged by the British during colonial times as a way of redirecting the efforts of warring factions into a unified ceremonial event. The durbars are held on major Muslim holidays, but also staged for special occasions, such as visits by important dignitaries. The northern part of Nigeria, where Kano is located, is a Muslim area, and the horse culture reflects a mix northern African and native Nigerian styles (Islam spread into Nigeria from its origins in Arabia via the Saharan trade routes). This site has a gallery of nice pictures of the processions. The fabrics used in the clothing are spectacular, as are the beautiful bridles on the horses. This photographer's site has some really stunning photos, including close-ups of the horses and regalia. Photo above: whereiseggy on flickr. Thanks for the tip about the durbar, Ot! A friend of mine snapped these pictures at a museum in Ghana. The label says this is a chief's regalia. 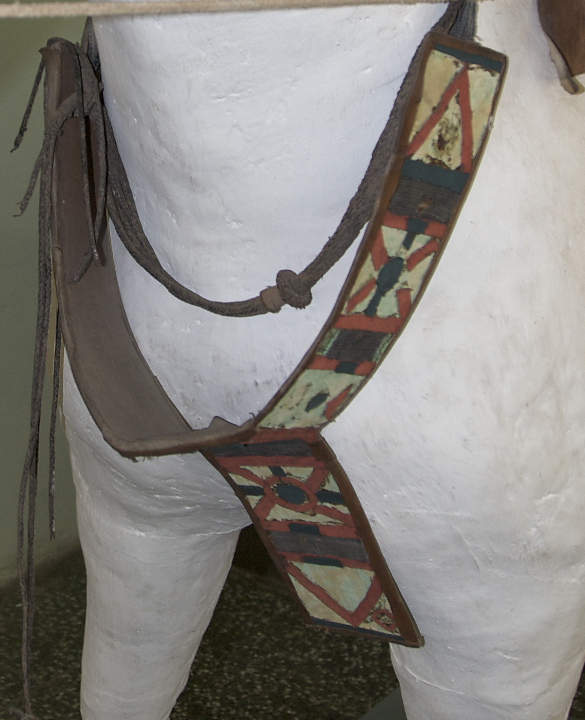 The bridle is obviously in a bit of disrepair - the reins normally connect to the ends of the loose chains that hang from the bit, and there should be decorative cheekpieces connecting the bit to the upper part of the bridle around the ears. What stands out is the decoration on the breastcollar - zigzag patterns in red on a white background. Even more beautiful is the rider's robe - a voluminous blue and white gown with embroidery on the chest. 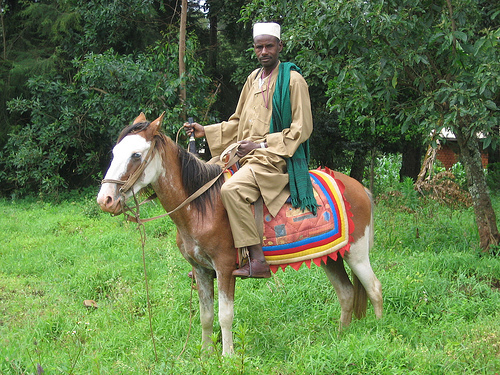 Look at the saddle pad on this horse in Cameroon! It is quilted and colorful and cheerful, especially compared to the very workaday bridle. The horse himself is a very flashy bay sabino with a quirky marking on his face. It looks like his tail is partly white, from this angle, and I think he even has a blue eye. The photographer mentions this man is particularly proud of this horse. Photo: rbairdpccam on flickr. Used with permission. 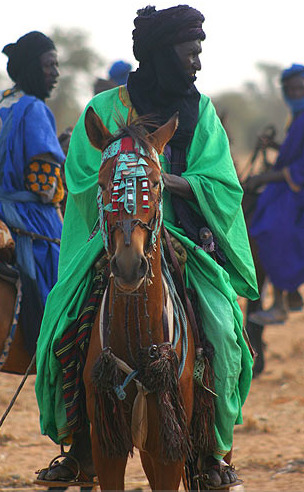 This beautiful photo of a Fulani rider showcases the ornamented tack often found in Africa. There seems to be a continuum of design in East Africa, North Africa and West Africa, perhaps because of the trade routes across the Sahara, and the use of horses by those traders, including the Fulani and Tuareg people. This image is from a series taken in Burkina Faso on the day of a horse race. The horse is of desert type, with a characteristic lean and narrow build; the browband is quite ornate, with a very wide band suspending a series of tassles. Check out the photostream to see some action shots as well. Photo: Keith Smith on flickr. Used with permission. This video is rather long and some of it is off-topic, but fast forward to minute 4:30 to see about five minutes of footage of a Nigerian horsemen in amazing costumes and tack. The notes for the video (on the lovely Internet Archive) indicate this is a parade of people going to a mosque (for a festival or holy day perhaps? ), and the horsemen are escorting a particularly important guy. The horses and riders are just astonishing. The horses are typical of the region, being related to the Barb. 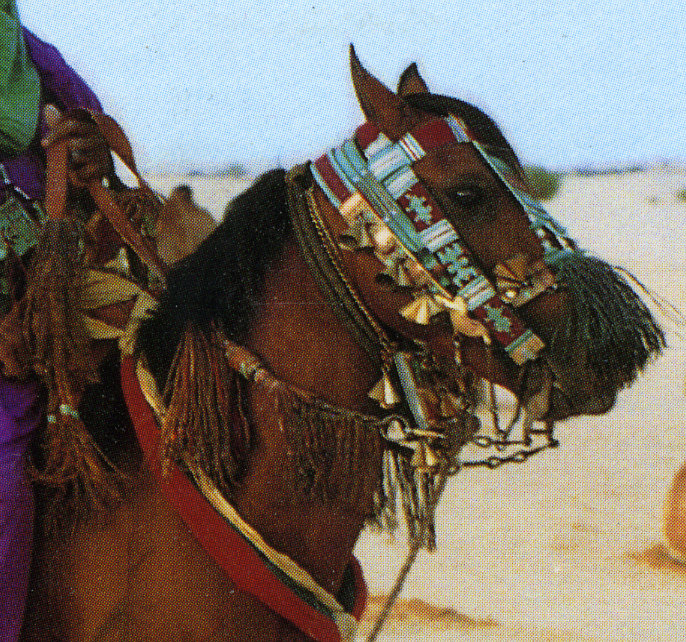 This photo, from an old postcard I have, shows in some detail the elaborate bridle of a Tuareg man's horse. The Tuareg are originally North African, from the area around Libya, being Saharan nomads. The largest Tuareg populations are now in Niger and Mali, in West Africa. The horse appears to be of Barb type. The dense fringes over the nose help chase off flies, as do the fringes on the reins. There are amulets around the horse's neck, and bells on the sides of the bridle. As the noseband does not go all the way around and buckle under the chin, like an English noseband, a centerpiece down the front of the face holds it in position.